Marguerita Dianne Ragsdale was born in April 1948 in Richmond, Virginia to Lillie and Vernon Ragsdale and raised alongside her five sisters on a farm in McKenney, Dinwiddie County, Virginia. After starting her undergraduate work at Virginia State University in Petersburg, she transferred to American University in Washington, D.C., where she earned a B.A. in journalism. Later, she earned an M.A. and a Ph.D. in foreign affairs from the University of Virginia, and a J.D. from Columbia University. A Middle East specialist, Ragsdale began her Foreign Service career in 1984 as Junior Consular and General Services Officer at the American Embassy in Kuwait. She then served in the U.S. Embassy in Mogadishu, Somalia as a Political Officer (1986-1988) before returning to Washington to act as Watch Officer in the Department of State Operations Center and later Desk Officer for the United Arab Emirates and Oman (1989-1991). In 1992, Ragsdale worked in the Middle East as Political/Economic Officer and, later, as Deputy Chief of Mission at the U.S. Embassy in Doha, Qatar. 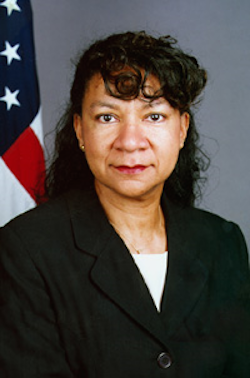 In 1995, she returned stateside, where she worked as a management analyst for the Under Secretary of State for Management and later participated in the Department’s Senior Seminar executive development program. Next, in her capacity as Deputy Director of the Office of Arabian Peninsula Affairs, Ragsdale supervised desk officers for the Arabian Peninsula states of Saudi Arabia, Kuwait, Oman, the United Arab Emirates, Qatar, Bahrain, and Yemen. In 1999, Ragsdale headed the Political Section at the U.S. Embassy in Pretoria, South Africa and within three years (2002), became Deputy Chief of Mission at the U.S. Embassy in Khartoum, Sudan. In November 2003, Ragsdale was nominated to be Ambassador to the Republic of Djibouti by then President George W. Bush and confirmed by the U.S. Senate in December of that same year. In February 2004, Ragsdale presented her credentials to Djibouti government officials and assumed her post. Ragsdale’s posting to Djibouti, a small East African country, was not insignificant. At the time, Djibouti’s political importance rested in its physical location on the horn of Africa directly adjacent the Gulf of Aden. The nation has Camp Lemmonier, the only U.S. military base on the African continent. During Ragsdale’s tenure, several collaborations between the Republic of Djibouti and the U.S. government were implemented that highlighted the importance of the nation’s physical and political features. For example, the U.S. Navy augmented the capacity of the Djibouti naval forces by conducting training exercises and donating refurbished patrol boats that once were part of the U.S. Coast Guard fleet. Construction of a fueling station for maritime and air traffic was also in the works during this time. Known as the “Defense Fuel Supply Point (DFSP),” the station at the Port of Doraleh served an important logistical function in regional and global security. During her time as ambassador ground was broken for a $7 million pier near the coastal village of Obock, which was designed to facilitate greater humanitarian, commercial, and military maritime access to the region. In terms of direct monetary aid, Ragsdale oversaw $27 million in direct U.S. monetary aid intended for education and health care programs. Ambassador Ragsdale completed her two-year term in the summer of 2006 at which time she was succeeded by W. Stuart Symington IV. Fluent in French and Arabic, Ambassador Ragsdale has a personal interest in historic preservation. Her hometown of McKenney has celebrated her accomplishments by naming a city street –“Marguerita D. Ragsdale Street” — in her honor. http://2001-2009.state.gov/outofdate/bios/r/36520.htm; http://www.defense.gov/news/newsarticle.aspx?id=15407; http://somalilandtimes.net/2003/100/10008.shtml; http://somalilandtimes.net/2003/138/13808.shtml; http://www.africaintelligence.com/ION/appointments-missions/2004/02/28/marguerita-diane-ragsdale,10245542-BRE; http://www.stripes.com/news/u-s-donation-of-patrol-boats-beefs-up-djibouti-s-navy-1.50402.